The EcoTech L1 Centrifugal Pumps is the Worlds smartest return pump. Included with the Vectra Pump are QuickCouple components, these fitted couplers provide the flexibility to make installation, cleaning and adjustments a breeze. The Vectra also boasts the ability to rotate the volute of the pump to adapt to the needs of your plumbing setup. Return Pump or Closed Loop. 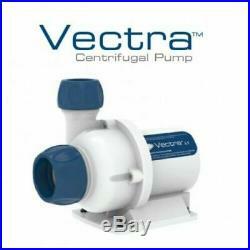 The Vectra can be installed and operated as either a return pump or as closed loop flow pump. Return Pump features calibration and Speed Lock. Closed Loop features random and pulsing modes. Vectra pumps feature a sealed motor and magnetic drive for internal and external operation as a return pump for Closed Loop flow. S flexibility will fit your needs for just about any setup that you wish to achieve. The Vectra driver features EcoTech? Choose between Return Pump or Closed Loop configuration. Access Vectra operational modes including Feed Mode. QD Technology minimizes DC motor noise. Communicates with other QD and EcoSmart compatible devices. Vectra Modes Return Pump Modes. Constant Speed Mode - The default mode of the Vectra, this makes the pump produce flow at a constant speed that is determined by the position of the dial. Feed Mode - At the touch of a button the Vectra will temporarily pause the current mode and idle allowing foodto be added to the tank without being cycled in the overflow and filtration. Speed Lock - Speed lock gives you the ability to lock in a desired speed on the pump by disabling the control dial protecting you from accidental and not so accidental unwanted changes in speed. ESL via Mobile Device - All Vectra pumps are compatible with the Reeflink. Reeflink provides completely wireless access to the World of EcoTech Smart Battery Backup Mode - Blizzard, Hurricane. A motorist hits a utility pole stuff happens. Vectra pumps are compatible with the EcoTech battery back-up. Lagoonal Random - Lagoonal Random mode simulates a low-energy lagoon environment. The speed of the pump is changed slowly to recreate the gentle currents of a lagoon. Reef Crest Random - This mode simulates a high-energy Reef environment. The pump will change speed frequently and drastically to simulate crashing waves and surging tide. This is a favourite of SPS Coral. Gyre - Gyre mode creates a flow pattern consisting of uniform clockwise and counterclockwise flow levels pulsing at a selected interval between 2 seconds and 2 hours. EcoSmart Live is EcoTech Marine? S web-based aquarium command center. It allows you to control your Vectra pumps, VorTech pumps and RadionLED lighting from anywhere in the world through a computer or mobile device (iOS and Android supported). Get real time information about your lighting and pumps or wirelessly update your product? Having issues getting the coral growth that you expect? Our award winning customer service staff can log into your account and suggest changes for you. In an aquarium with no flow, fish and corals begin to die in as little as 4 to 10 hours. Hours are estimated and will vary depending on battery life, pump mode and other factors. Cost Savings - Traditional AC pumps when used as a return pump for your sump are flow controlled through the use of a choke valve. This is method of control is inherently inefficient for two reasons. 2 By adding artificial impedance to your flow, electricity is wasted. The Vectra pump will always operate at the optimum efficiency because there is no need to use a flow restricting valve to achieve your desired flow rate. Active Feedback - When used with the ReefLink, your Vectra pump can send you performance and status alerts right to your mobile device or computer. Your return pump is the heart of your aquarium; the faster you hear about an unexpected issue the more successful you will be as an aquarist. Flow: 3,100 gph (11,500 lph) Max Head Pressure: 21.5 feet (6.5 m) Input/Output Input: 1.5 inches (38mm) Output: 1 inches (25 mm) Power Wattage: 130 watts. The item "Ecotech Vectra L1 Return Pump" is in sale since Friday, March 8, 2019. This item is in the category "Pet Supplies\Fish & Aquarium\Water Pumps". The seller is "crfspeedfreak86" and is located in Coventry. This item can be shipped to United Kingdom.